Sustainable, community-based mitigation program that provides safe water through modern bore-dugwells, and conducts public education on water-related health issues and personal hygiene practices. Project Well (based in California) together with partner NGO Aqua Welfare Society (based near Kolkata, West Bengal), developed a sustainable, community-based mitigation program in 2001 to provide arsenic-safe water to the villagers of the North 24 Parganas districts in West Bengal, India. Crystal-clear drinking water extracted by shallow and deep borewells (locally known as tubewells) is plentiful in the villages of West Bengal, but it is contaminated with arsenic. Between 2001 and 2010, Project Well constructed 167 modern dugwells. The modern dugwells designed by Project Well are sheltered and the water is extracted via a hand-pump. The design of these modern dugwells was revised and tested in 2007, and from then on, different types of wells were constructed depending on the thickness of layers of sediments in different areas. Now there are 96 modern dugwells (mostly constructed in 2007 and earlier), 61 bore-dugwells and 10 shallow borewells. The primary objectives of Project Well-Aqua Welfare Society are to provide safe water through modern bore-dugwells and to establish and encourage community-based groups (CBGs) to manage these arsenic-free water sources, so that they are sustainable. Project Well also regularly educates the community on arsenic and other health issues ..................................Please view rest of the background in the profile of Project Well. The Project Well-designed modern dugwells, borewells and bore-dugwells are spread out through 58 villages of 6 blocks of the 3 districts of North 24 Parganas (142), Nadia (22) and Mursdhidabad (3). These are the three main districts that are affected severely with arsenic in both the government community and private tubewells, the main sources of drinking water. 40 persons for each modern bore-dugwell. The consumer demographic data will be entered after registers are created, when the communities start drinking. The data will be computerized by the end of 2012 or beginning of 2013. In 2010, construction of 40 bore-dugwells and 10 borewells were completed and in 2011, construction of fifty bore-dugwells are ongoing. The total number of consumers from the sources constructed in 2010 is 1,964. The bore-dugwells are in three schools and one public health clinic. Out of 50 sources, 11 sources were never used due to various reasons including a neighborly dispute. Efforts to educate people are continued through village meetings and health meetings. During site selection, village meetings are held in groups at the proposed site and also at panchayet offices. For construction of 50 bore-dugwells, 60 village meetings were held because 15 sites were cancelled due to non-availability of the water-bearing sand layer or due to disputes in the para/community. Apart from the village meetings, from January 2011 to July 2011, 45 health meetings were held at an in schools or community-based groups to improve the number of users. From August to December 2010, there were 34 health meetings as per record. The field workers visit the communities every month to remind them of the importance of drinking arsenic safe water and practicing proper hygiene, especially handwashing before handling food. Parents are advised to give children under 5 years water that is boiled. We face a challenge persuading people to drink chlorinated water (which might have a chlorine odor and/or taste) when they are used to drinking crystal clear water (often referred to as ‘sweet’ water by villagers) containing deadly arsenic. Thus, visiting the villagers repeatedly, soliciting their feedback, and implementing improvements will help bring about change more effectively than simply implementing a water source and then leaving. 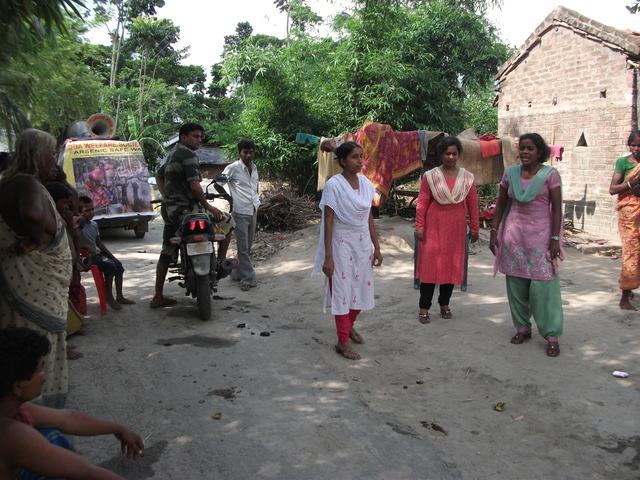 At the end of May 2011, the field workers organized a 15-minute street drama enacted on four consecutive days to educate and inform the general public about the arsenic crisis and its solution (the video will be available soon on youtube).This show was done each day at four busy intersections or at a bazaar in Gaighata, Swarupnagar and Kolsur Blocks. There are plans to do the same in the Chakdah block of Nadia. In September 2010, four working staff of Aqua Welfare Society (AWS) attended a tri-party information exchange program at Pondicherry that helped in capacity-building and improvement of the dugwell program. Also in February 2011, they attended a second workshop at the Infocom Conference and Exhibition 2010/2011 in Kolkata. 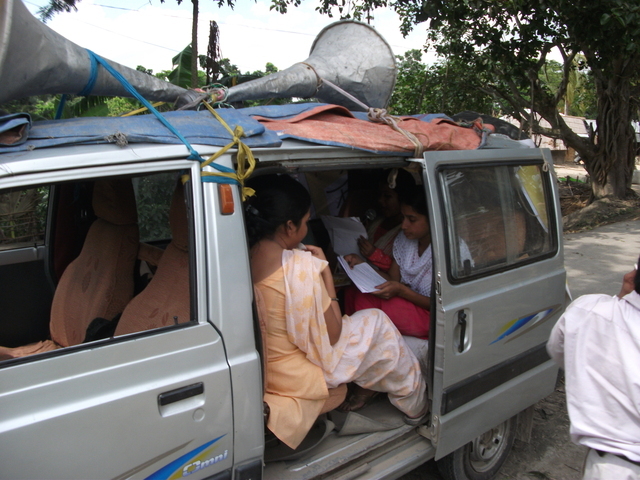 In November 2010, an awareness meeting was held at a college to educate the students and a few teachers. In October 2009 the members of AWS demonstrated their program at the 3rd Annual Forum of the Water Community of India conference held in Kolkata. In addition, Project Well also presented the program at an international conference organized by American Geophysical Union in December 2010. 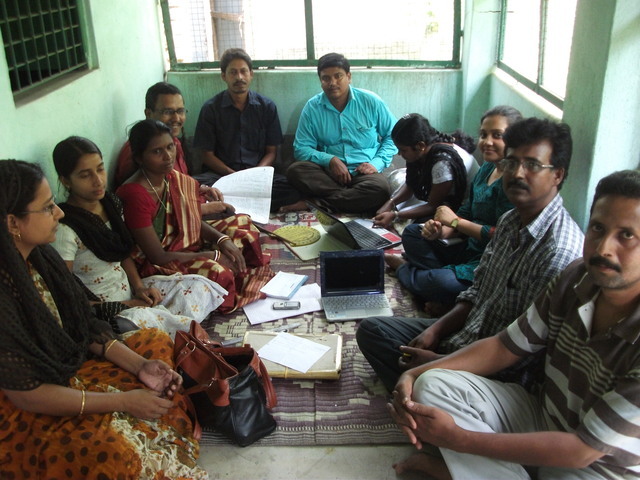 In November 2010, two professional photographers from San Francisco Bay Area visited the dugwell program in West Bengal, India, to document and promote the work of Project Well. They also gave presentation to the Rotary Club members of Sausalito and helped Project Well present the project at the International House of University of California, Berkeley. Most Project Well water sources are conventional dugwells, with a modified design that reduces potential bacterial contamination, constructed at carefully selected sites. The dugwells are fed by rainwater and are therefore not contaminated with arsenic. Wells are also protected from external contamination by a net cover and a tin roof. 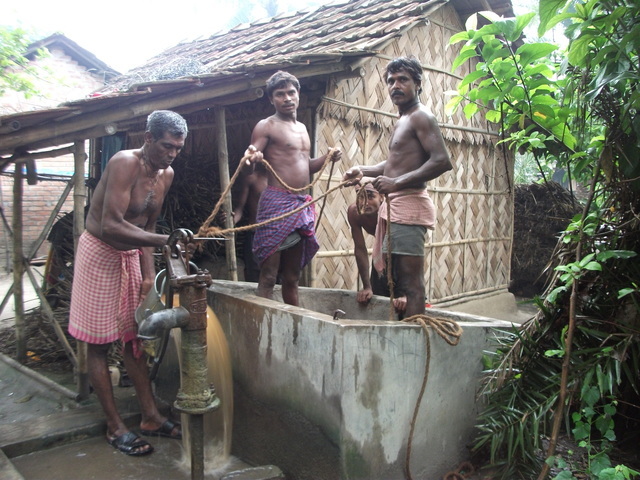 Water is withdrawn using traditional hand-pumps. (For photos, published reports and newsletters, please visit www.projectwellusa.org). From 2003 to 2008, due to the El Nino effect, annual rainfall decreased from 380 cm to 70 cm. To increase the depth of dugwells in some areas where availability of water is especially scarce in summer, a new design has been experimented with that has turned out to be groundbreaking. It is a bore-dugwell (PW74GDP1, http://peerwater.org/projects/72 ). Careful selection of sites is very important and the geologists advise using Google Earth. In 2009, fifteen bore-dugwells were constructed at an average depth of 28 feet. In 2010, Project Well installed 40 more bore-dugwells and 10 borewells of 27 feet, with diameter of 10 inches and thickness of 8 millimeters, tapping water from unconfined aquifer. The advantage of borewells is that they look and work much like the tubewells that villagers are comfortable using, and thus may gain easier acceptance. But in 2011, after measuring the arsenic concentrations of the borewells, a decision was made to only construct bore-dugwells since five out of ten borewells had arsenic levels higher than 50 ppb. One borewell (PW118) has already been converted to a bore-dugwell by digging a 3-foot diameter hole around the borewell up to 16 feet deep, leaving 10-foot PVC pipe inside the dugwell. These wells are all under observation for arsenic levels that are tested every two months for one year. The bore-dugwell will be 25 feet deep in total, with 18 feet of dugwell and 10 feet of PVC pipe of diameter 10 inches and thickness 10mm. The PVC pipe is perforated and adapters are used in both ends. 7 feet of the pipe will be inserted into the ground with 3 feet exposed and overlapping with the dugwell portion. A flexible pipe of 1.5 inch diameter delivers water via a hand-pump. At every new area a pilot test is done by boring a hole to locate the depth of the water bearing sand layer. In Chakdah this year 10 sites were cancelled due to non availability of sand layer within 25 feet. For 21 sites 18 pilot tests were done to avoid spending the full cost of boring the 18 inches hole because the cost of pilot test is only Rs. 400/- (9 USD). One phase, with the training of the community over a of period of one year. Subsequent visits to the communities are ongoing until the operation and maintenance of the dugwells become sustainable. The demand for more dugwells is still high in the Chakdah block of Nadia and the Swarupnagar blocks of North 24 Parganas, where the population is large and people are aware of the health effects of arsenic. In many blocks of these districts, the government is establishing pipeline water supplies. It is difficult to construct pipelines in the remote areas that are more than 3 kilometers away from the main road, where Project Well is keen on constructing bore-dugwells. In 2011, 60 village meetings were held before construction. Similar village meetings will be held at the proposed sites. The site selection will primarily be done by the local field workers, followed by organizing the village meeting where experienced staff like the technical manager and the project manager will discuss the bore-dugwell program in detail. During this meeting, the owner of the land donates a plot of land to construct the bore-dugwell for his neighbors or community (the dugwell is not constructed on government property). A sense of ownership develops from the very start through this donation of a plot of land by the community. After approval of the selected sites by experts, based on local geology and existence of arsenic-contaminated tubewells nearby, community-based groups (CBG) are formed. These groups comprise people who will be using the bore-dugwell water. The family that donates the land becomes the chief caretaker. To maintain the well, training is given to a person in the community who is capable of measuring the volume of water in the well, from which the disinfectant dose is determined. A user-friendly chart is given as a guide for the dose of disinfectant to be applied. In areas where it is hard to find a literate person, a field worker measures the water and gives a three-week dose for users to apply. The disinfectant is supposed to be purchased by the CBGs, but very few CBGs do this; however, they do take care of minor wear-and-tear repairs of the well and the hand-pump. Once a year, arsenic analysis is overseen by Project Well. A sense of ownership and investment develops amongst the users as they pay for the maintenance to obtain arsenic-safe water. These projects are implemented by our local affiliate non governmental organization, Aqua Welfare Society (AWS). Government interaction with the Block Development Office (BDO) and panchayets comes only right before starting the program, in terms of informing them about our work in the area, to avoid any duplication of efforts. Sometimes government officials, such as members of the panchayet, help us select sites that later are given scientific approval by experts..For construction in new areas of Swarupnagar, Chakdah, Haringhata, Baduria and Bashirhat, meetings with the local panchayets were held. At the meetings, the possibility of pipelines installed by the state government is discussed but the block development officers did not know where the pipelines would be laid. Hence, later during site selection and after BPN had approved the proposal, Haringhata and Bashirhat were cancelled becausepipelines were already being laid. In the new areas of Chakdah block, some sites were suggested by a panchayet member. For bore-dugwell construction in 2012, similar meetings with the local panchayets in new areas will be held if needed. Plans to meet with the BDO’s of a few affected blocks of the district of South 24 Parganas will be included in the protocol. Generally, the project manager and the technical manager of AWS meet with the officials. Project Well keeps a database evaluating the use of the arsenic-safe wells, using Google Maps and an Excel file that connects two components: Dugwell identification number and number of users. The Excel file also contains an assessment of the water quality. In addition, the field workers record notes on all the technical wear-and-tear that are to be fixed by the consumers if there are enough collected funds; otherwise, the cost is subsidized by Project Well. Consumers are visited by grassroots field workers monthly during the first year to train them on how to use the theoline disinfectant, to record the number of dugwells used and to ask about diarrhea and dysentery outbreaks. More frequent visits are made to sources that are not used or underused, with special awareness programs and to get feedback from the community. This year 38 dugwells were dredged during the summer season based on the feedback of the people that they do want to re-start using dugwell water since the amount of rainfall has diminished (see the photo). Two to three times a year, a senior Project Well member visits some of the dugwells selected at random from the map to cross-check data produced by the field workers. Research and development on the dugwells is ongoing. In 2010, eleven out of 50 sources are currently not being used. The handle with the top of one tubewell was stolen, one well needs some repairs, three new sources showed arsenic more than 50ppb and we are waiting for the arsenic report on the water collected in June. There is some neighborly dispute at one well site and another well is still dry. People are not using two wells though water quality is normal. These eleven sources are labeled ‘special care’ dugwells, and meetings with the potential users are held from time to time to deal with the problems. Bacteria tests of all the dugwells of 2010 were done. The report showed e.coli counts as ‘undetected’. There is plan to have about 25 % of the historical dugwells, selected randomly, analysed for cross check in another certified laboratory in Kolkata for total coliform and e.coli sometimes this year. Bacteriological tests of the newly constructed bore-dugwells will be done as soon as the construction is complete. For the first time in 35 years, a new political party has come into power in West Bengal. This party is in favor of supplying treated surface water in the arsenic- and fluoride-contaminated areas. Dugwells may finally get attention and we are making efforts to meet with the ministers in charge of public health, engineering and environment to get their support to promote community-based dugwell programs. The users will be required to purchase Theoline, the chlorine disinfectant, and also repair minor wear-and-tear. Field workers will visit the wells every month for one year to get technical and utility reports, after which they will inspect the wells once or twice a year. Properties on which to construct the dugwell, as well as fresh cooked meals for the team of diggers and field workers on the days of construction. The communities pay for the maintenance of the wells, including chlorination and repair of normal wear-and-tear. Project Well has submitted 6 applications and only one will be reviewed and the other 2 will inherit its review.